Police detain protesters at Turkey's decision to end PKK peace process, Istanbul. Demotix/Erhan Demirtas. All rights reserved.The elections Turkey held on June 7, 2015 have not changed the government yet, but it is a game changer in terms of Turkey’s foreign policies in the Middle East. The AKP government has long been accused of active collaboration with ISIS allowing fighters, money, and munitions to move from one side of the border to the other. Even those analysts who consider such active collaboration anecdotal are clear that Turkey has been very reluctant to take direct action against the organization. In October 2014, when ISIS fighters surrounded the small Kurdish town of Kobane in Syria, the Turkish government refused to allow the Iraqi Peshmerga forces to cross through Turkish territory and denied Washington permission to fly offensive operations out of the US Air Force base at İncirlik in Southern Turkey. Turkey has never been considered particularly supportive of the international coalition fighting ISIS. This policy changed on June 24, 2015, when Turkish fighter jets attacked ISIS targets in Syria. The AKP government has also been in a negotiation process with the PKK since 2009. The first round of negotiations collapsed around 2010, and the second round of negotiations started in the beginning of the 2013. Right before the June 7 elections, in February 2015, the AKP government and Kurdish politicians came together in Dolmabahce Palace. After the closed meeting, PKK’s jailed leader Abdullah Öcalan’s statement was read to the media calling on the PKK to convene a congress, take a decision “on ending the armed struggle” and take up democratic politics. Although President Erdoğan would explain his dissatisfaction with the meeting soon after, Prime Minister Davutoğlu described it as the beginning of a new phase in the peace process. However, just months after this historic meeting, the same day that the Turkish jets bombed ISIS targets in Syria, they also bombed camps of the PKK in Northern Iraq. This bombing, which happened for the first time in four years, effectively ended the ceasefire and the peace process. Domestic politics is typically an important part of the explanation of states' foreign policies. It has been well-documented by theorists of international relations how governments with declining electoral success may use adventurous foreign policy choices or make radical shifts in their foreign policies to gain re-election. Known as diversionary wars, conflicts of this sort arise from the efforts of leaders whose grip on power is at risk. They may help these declining leaders retain their power. The last general elections in Turkey were a turning point for many of its citizens. For many, it was the last exit from a road leading into an abyss of increasingly authoritarian rule by the AKP government, claims about sky-high corruption, and constant violations of the existing constitution. In fact, despite a powerful opposition that further increased in strength after the Gezi Park protests, the AKP government had considered itself virtually invincible at the polls. After the Gezi Park protests of 2013, the AKP even saw gains in the local elections as well as in the presidential elections, which Erdoğan had entered as AKP candidate. As expected, in the 2015 general elections, the AKP once more took first place, bringing in 40.9 percent of the vote. But this percentage—which under normal circumstances would have been celebrated as triumph—became the party’s first “defeat”, due to a loss of 9 percent resulting in its inability to form a single government based on their lowered number of seats in parliament. The AKP’s inability to secure enough of the vote to form a single party government this time around has now also made it impossible to introduce a presidential system, as had been suggested by the AKP government and specifically by President Erdoğan. This “first defeat” of the AKP has largely been perceived as a success of the HDP, the People’s Democracy Party. The HDP was established in 2012 as an umbrella party for various groups with feminist, green, and socialist agendas. Among them, the largest was certainly the BDP, an extension of the Kurdish parties, which since the 1990s had constantly been closed down and re-established. When HDP declared it would enter these elections as a party (not with independent candidates as small parties do to surpass the 10 percent threshold), many believed that the Party could not cross the threshold. However, as a relatively new party, the HDP received 13.1 percent of the overall vote, sending 80 opposition MPs into parliament and gaining support not only in Kurdish-dominated areas, but also a significant percentage of the votes in the country’s western region. The electoral “success” of the HDP was mainly based on the electoral support of the Kurds. Many Kurds who had previously voted for the AKP retracted their support in the June 7 elections. In fact, for the last decade or so, the AKP and Kurdish political parties had shared the Kurdish vote almost equally; however, in this instance the balance radically tipped towards the HDP. In the Kurdish provinces, the HDP ranked first virtually everywhere. There were two factors that contributed to the tipping of the balance: HDP’s inclusive and peaceful politics and the AKP’s attitude throughout the protracted Kurdish peace process, which has appeared indecisive, ambivalent and condescending to many Kurds. However, the most critical moment for the Kurdish voters’ decisions and preferences came when the government refused to assist the Syrian town of Kobane while it was besieged by ISIS, when claims that the government even supported ISIS against the Kurds found wide reception. The Kobane protests on 6 and 7 October 2014, which resulted in protests against the government’s attitude towards the Syrian Kurds and ended in the death of 42 people, would become crucial in shifting votes from the AKP to the HDP. The AKP’s stance concerning the Kobane protests, which the Kurds perceived as hostile, and its lack of response to ISIS led to this turn towards voting for the HDP. Turkish politics once again faces the return to coalitional politics, a predominant feature of the Turkish politics during the infamous 1990s. The AKP, and specifically President Erdoğan, have often stated their distaste for coalitions. In fact, AKP party politics throughout their rule have greatly emphasized the importance of political stability which, it was argued, is directly linked to single-party executives. AKP cadres have constantly explained the political chaos of the 1990s with reference to its coalitionary politics. What complicated the whole affair was the position of President Erdoğan. All parties in the parliament other than the AKP (that is HDP, CHP and MHP) have stated that their first coalition principle is the restriction of Recep Tayyip Erdoğan's use of his presidential powers. All three parties have been extremely critical of Erdoğan’s meddling in governmental affairs, authoritarian tendencies, and his aspiration to shift to the presidential system. All of them have also accused the AKP (and specifically President Erdoğan) of corruption and illegal deeds; stressing the need to bring these corruption cases to justice. Thus, any coalition would mean significant limitations to the power of Erdoğan and even the bringing to trial, if not of Erdoğan himself, then of some of his close allies. Furthermore, all the parties within the Parliament share this reluctance to form a coalition with the AKP because it could cause them to lose votes at the next election. When President Erdoğan gave the mandate almost a month after the elections, on July 9, to the prime minister and AKP leader, Ahmet Davutoğlu, chances for coalition were already slim. Ahmet Davutoğlu then had 45 days to form a government; a failure to do so would result in new elections. Everyone seemed to agree this was the likely outcome. But if there are new elections, will the preferences of the voters change? Polls and experts suggest that there won’t be major shifts in the electoral alignment of the voters in any early elections. Why would voters change their preferences? As suggested above, foreign policy and specifically policies involving war can have a sudden and major impact (perhaps alongside economic crises) on the preferences of voters. “Rallying around the flag” has often been used to explain increased popular support for executives going into an international crisis or into wars. Politicians may not act upon theories, but they do know how to shape politics. By targeting ISIS and the PKK at the same time, the AKP has tried to affect the preferences of nationalist voters who have been in opposition to the negotiation process with the Kurdish movement. Given that the AKP lost almost all its pro-negotiation Kurdish votes to the HDP, the most significant votes that the party could appeal to in any upcoming early election will be Turkish nationalists. Furthermore, by fighting with the PKK, the AKP government is trying to push the PKK into continuing its fighting in Turkey, which would alienate some of the HDP voters who assume that there is a close connection between the party and the PKK. So the real target of the AKP’s recent operations is domestic public opinion, and specifically the nationalist/conservative voters. Why target both PKK and ISIS at the same time, given that targeting only the PKK would be enough to appeal to the nationalist/conservative votes? Not everything can be explained by domestic politics. Targeting either the PKK or the ISIS alone would not be possible, given the regional balance of power. ISIS and the PKK/Kurds are major adversaries in Syria and Iraq. Targeting ISIS alone would have strengthened the Kurds—which was Turkey’s major reason for its “alleged” support to the ISIS and also its reluctance to fight effectively against it. Furthermore, targeting only ISIS alone would not have brought more votes (and would even cost some votes to the party). It is a risky route domestically. Targeting the PKK alone was also not possible, and would be a risky move internationally. The PKK/ Kurds have become allies of the US in the fight against ISIS, especially after the Kobane battle in 2014. Had Turkey only targeted the PKK, it would have alienated its major western allies and become isolated. Turkey has been under strong pressure to join the anti-ISIS coalition and toughen its stance against the organization. Furthermore, the Suruç bombing of last week, committed by ISIS, that killed 32 young activists, made it more difficult not to take a stance against ISIS and served as a useful pretext for the operation. So the AKP government has decided to revive Turkey’s conservative/nationalist voters’ longstanding animosity towards the Kurds alongside responding to the international distaste for ISIS to guarantee a short-term electoral success. This, AKP hopes will please Turkey’s international allies and help the AKP increase its votes in any possible early election. As the AKP government commenced this risky operation, pro-government media have begun to direct their propaganda against the HDP, accusing the party of promoting a terrorist agenda. In just two days, alongside the operations against the PKK and ISIS, 590 people across Turkey have been detained. Most of the detainees are not ISIS members but leftist and Kurdish activists. Many left and Kurdish websites are also under a ban. The theory on competitive authoritarian regimes suggests that competitive authoritarian governments, using all available means, always win the elections. In the short term, this move may guarantee electoral success for the AKP government. 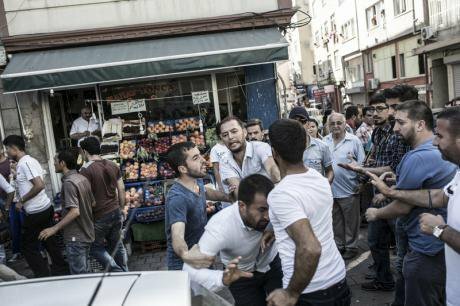 In both the short and the long term, however, it will mean another sharp increase in violence and authoritarianism, both inside Turkey and in the Middle East. Barkey, H. (2014). How the Islamic State Took Turkey Hostage. Foreign Policy,21(09), 2014. For a discussion of such policies see Smith, A. (1996). “Diversionary Foreign Policy in Democratic Systems”.International Studies Quarterly, 133-153. Russett, B. (2003). “Reintegrating the Subdisciplines of International and Comparative Politics.” International Studies Review, 5(4), 9-12. Magaloni, B. (2006). Voting for autocracy: Hegemonic party survival and its demise in Mexico. Cambridge: Cambridge University Press.